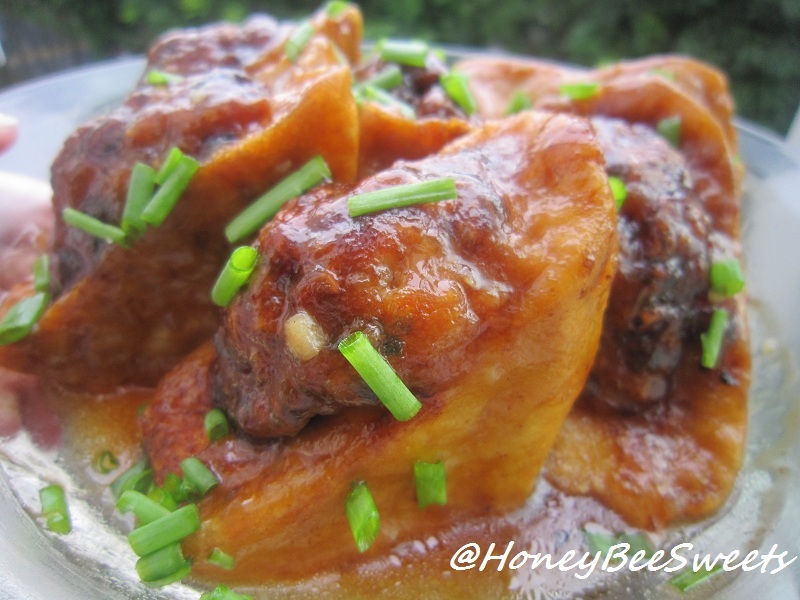 Before the Lunar New Year is over, I want to post up a savory dish that I made awhile back. 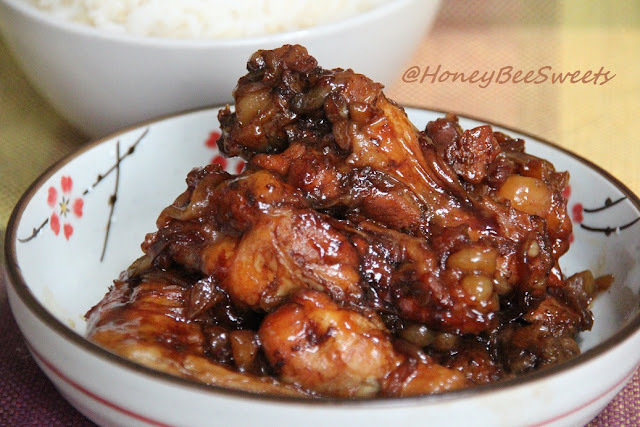 And I believe this dish is a presentable one to serve during new year. 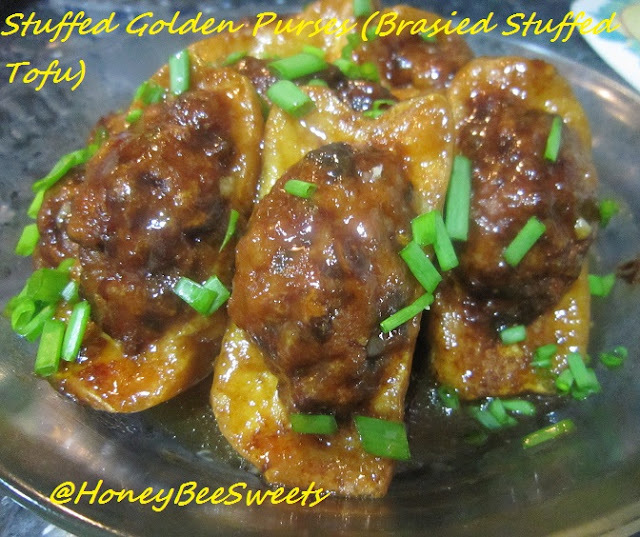 Its actually Stuffed Braised Tofu but I changed its name to Stuffed Golden Purses (金钱袋), to make it sound more festive, lol! I bet many of you out there know what Yong Dao Fu (酿豆腐 ) is. 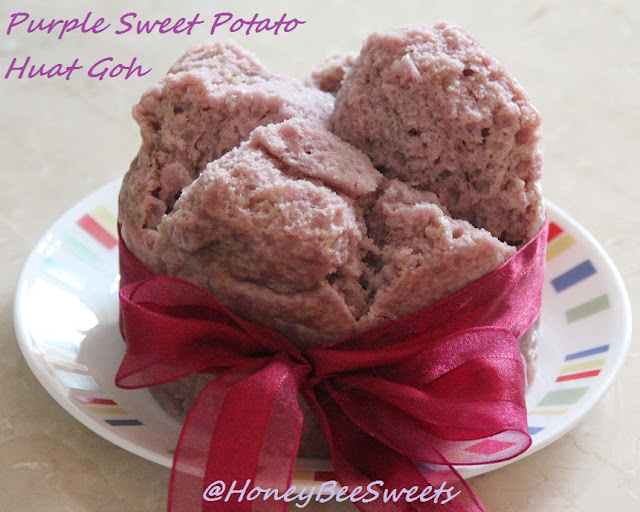 This stuffed tofu is pretty similar to that, just that instead of stuffing it with the usual fish paste, I used minced pork and loads of other ingredients. My family loves any kind of tofu dishes, so this was a good one to serve up to them. If you too love tofu dishes, read on! In a mixing bowl, add in all the ingredients for the filling and marinate. Mix well and let sit for at least an hour in the fridge before use. 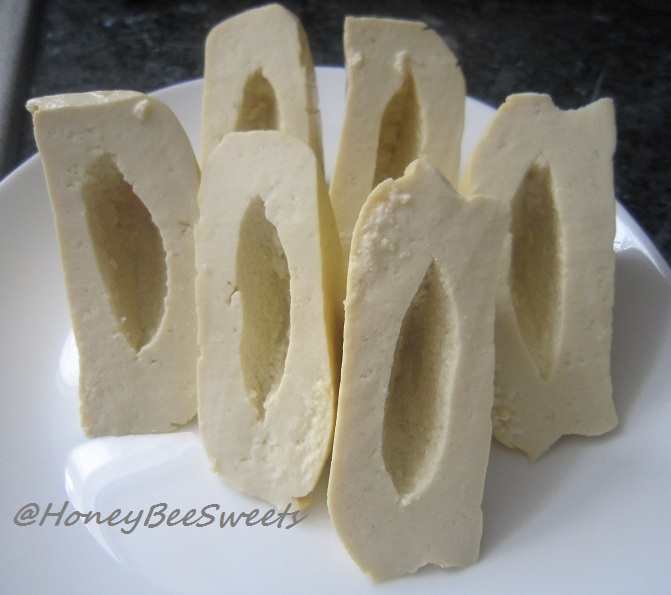 After an hour, fill the tofu cavity with the filling and try to stuff it full so it will look nice and packed. (Just like what you wish your wallets to be, lol!) See Pic 1. Pat the stuffed tofu some cornflour and heat up a frying pan with about 1 cup of cooking oil. See pic 2 and 3 above. Pan fry the tofu till golden brown, dish up and drain on paper towels. See pic 4 above. Pour away the oil the pan and lower the heat to small. In a small bowl, mix all the ingredients in seasoning and pour into the pan and let it simmer till it thickens a little. Add in the stuffed tofu and let it coat with the seasoning sauce. After 2 to 3 minutes, dish up and sprinkle some fresh chopped green onions over as garnish if desired. I am happy to submit this Stuffed Golden Purses (Braised Stuffed Tofu) to Aspiring Bakers #15: Auspicious Dishes for CNY (January 2012) which is hosted by Wen's Delight. Okay folks, gonna end my post for now and be back REAL soon. Have a good evening! 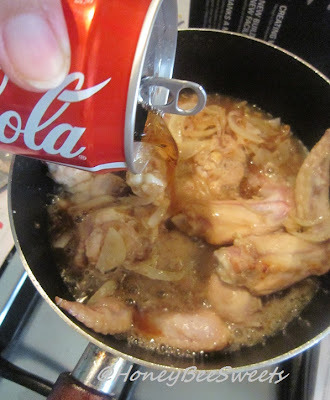 I'm not a Coke drinker, but lately I have been stocking up a few cans of coke in my house just to cook this dish. 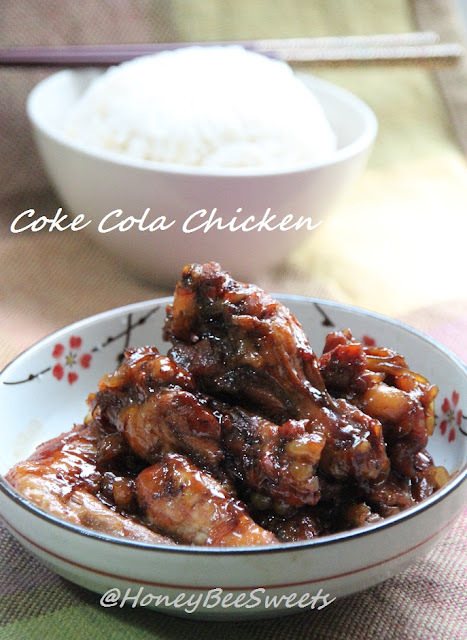 It is one of the easiest and most yummy chicken dishes I've come across....finger licking good! Marinate the chicken wings with the seasoning and let seat for at least 2-3 hours before use. In a pot, heat up 1 tbsp of cooking oil. 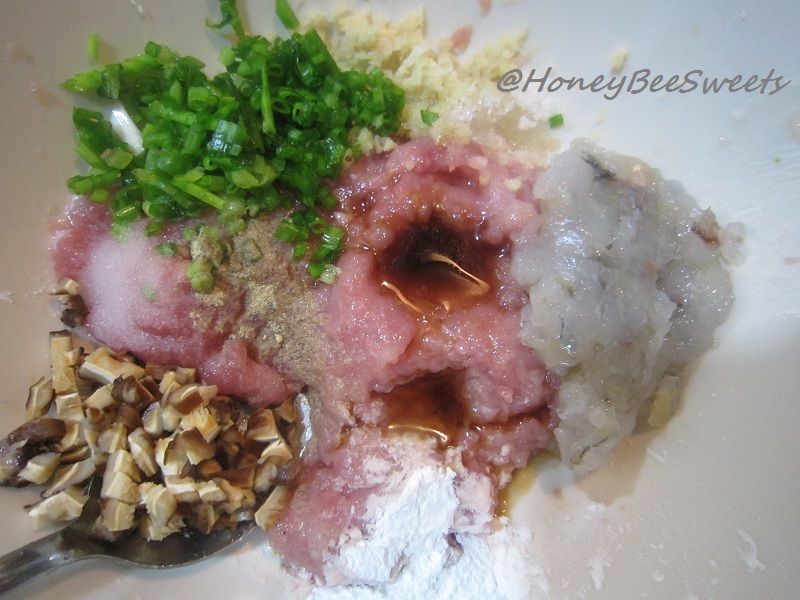 Add the minced garlic, sliced ginger and saute till fragrant. Then add in the chicken wings and cook till opaque in color. Add in 1/2 cup of water and let boil. Then pour in the coke and let boil. Once it starts to boil, lower heat to simmer. 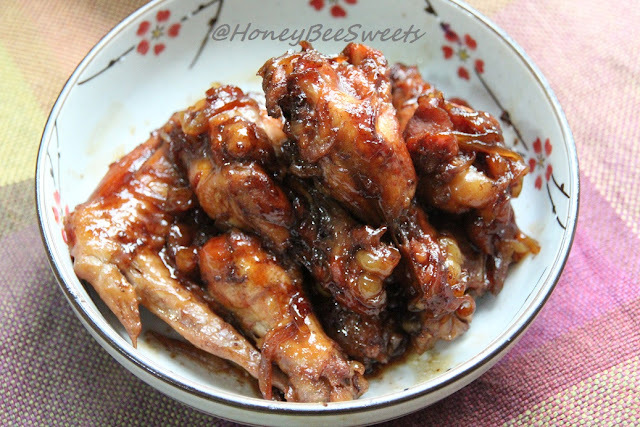 Cook till the liquid is reduce into a thick sauce, about 40 to 45minutes. Serve hot with steam rice. If you are like me, always looking out for easy, delicious dishes to serve up your family, you should definitely give this one a go. 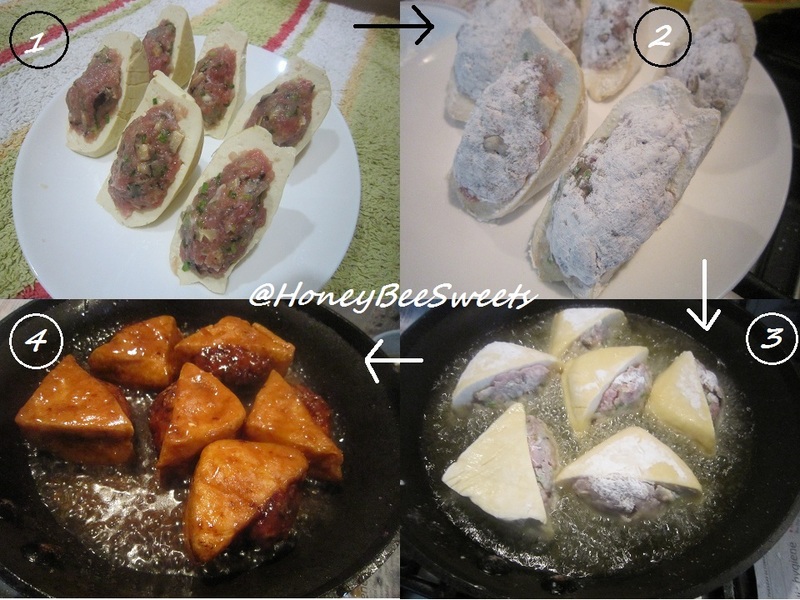 It's really easy, really delicious and I guarantee that you will cook this over and over again! Try it! In a blender, blend the sweet potatoes, eggs, sugar, milk and oil together till smooth and uniform in color. 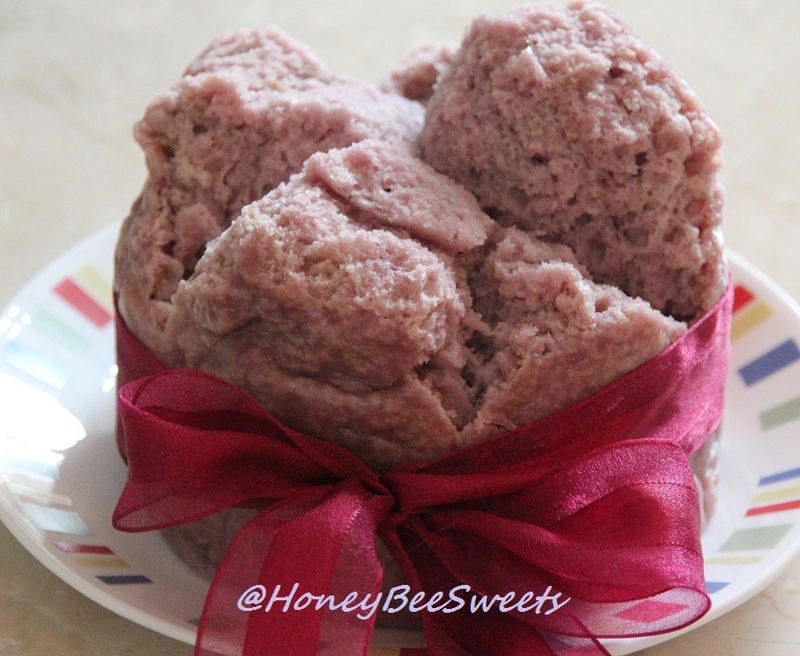 In a large mixing bowl, sift in the cake flour, rice flour and baking powder in. Pour in the sweet potato mixture and stir in till well combined. Prepare the steamer and keep it at a boil. Prepare the two 6" round pan (mine is 3" deep) lined with waterproof baking paper. Pour the batter equally into the 2 prepared pan and let steam in the steamer for 30 to 40 minutes till tester comes out clean. Okay folks, gonna end here today. In any case I can't post up before the new year arrives, Happy Lunar New Year to All! Huat Ah! Happy 2012 everyone! Hope my wishes are not too late! :P It's only been a week since we entered into this new year and I'm already been crazy busy since then! What have I been up to? It should be no surprise as this year's Lunar New Year is just a couple weeks away, so I've been busy with Chinese New Year cookies, that's why! :P Orders came in and I just took them, not even sure I can finish baking them in time or even consider is it really worth the time?! :P So wish me luck my friends...these 2 weeks' gonna be real hectic for me. 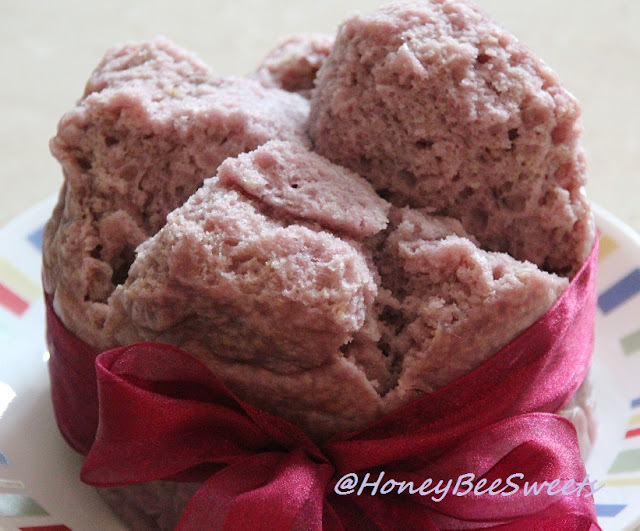 Combine everything in Set A and knead till everything is well combined and the dough slightly smooth. 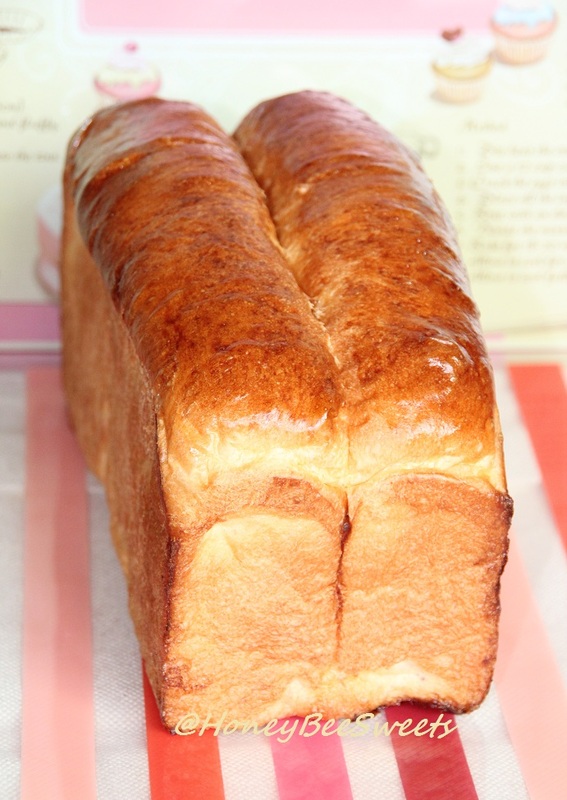 It is not required to knead till elastic stage. Cover and let dough proof for 2.5hrs in a warm place. Punch out the air from the pre-fermented dough and combine everything in Set B to it. Knead well till it reaches elastic and window panel stage. It took me about 20 to 25 minutes on my KA mixer at medium speed with 2 times of 2 minutes break in between. Cover and let rest for 30 minutes. Divide the dough and roll round as desired. Place in the greased loaf pan to rise till 90% full. Preheat the oven to 175C with fan. 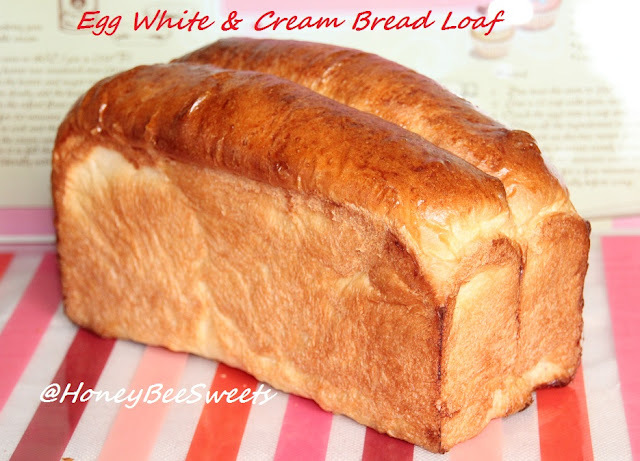 Glaze the top of loaf with egg wash or milk and bake in the oven for 30 minutes. 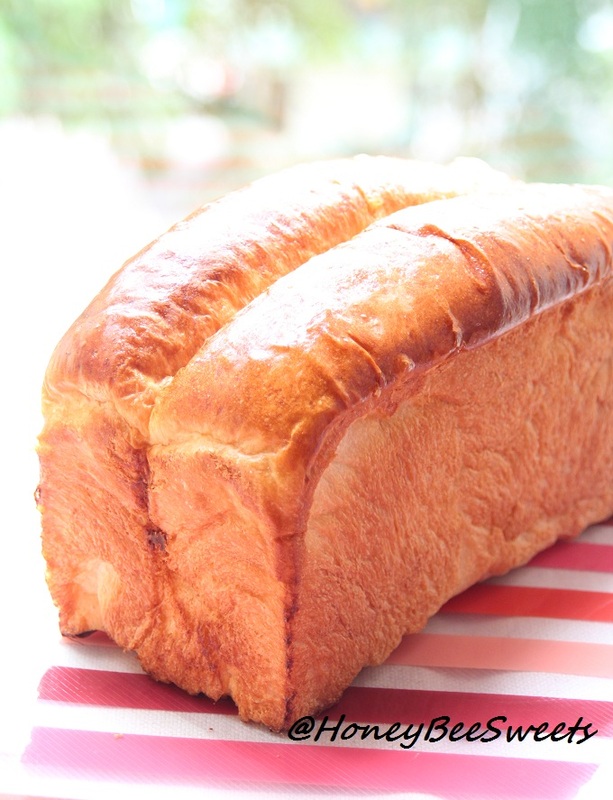 Cover the loaf with aluminum foil if the top browns too quickly. Once done, remove from oven and remove from pan immediately, cool on rack completely before slicing. 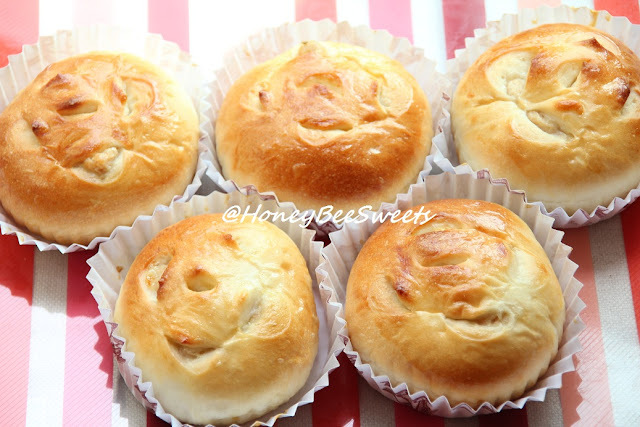 I made some tuna buns for my parents too, it's their favorite. 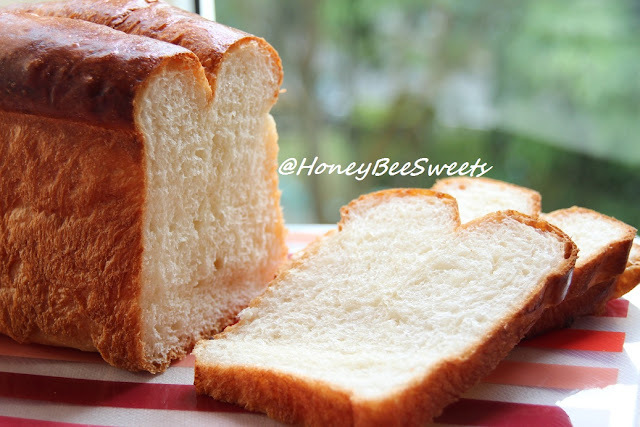 ;) This recipe is pretty versatile, good as a loaf and good with filling too. :) Do try it out. One thing to note is that I found the proofing time takes longer then normal, perhaps it's the small amount of yeast added. But again, who needs to eat so much yeast! Okay all, have a great weekend! Cheers!